St. Andrew’s Episcopal School educates children in Pre-Kindergarten through 8th Grade. St. Andrew’s believes in “Cherishing the Decade of Childhood,” educating children in a safe, nurturing, and loving environment from ages four through fourteen. 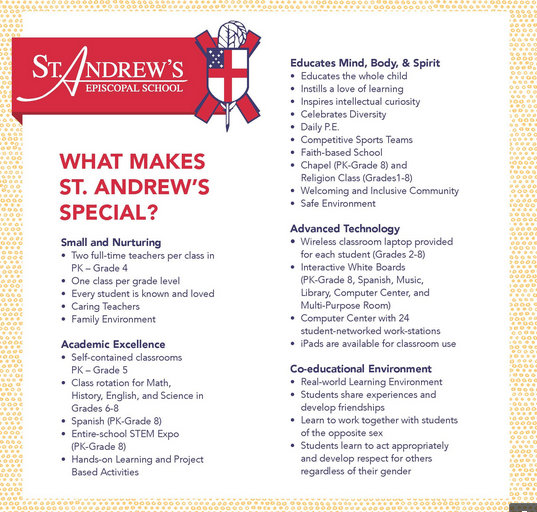 St. Andrew’s faculty specialize in Early Childhood, Lower School, and Middle School education. Classrooms are arranged and the curriculum is presented at age-appropriate levels. St. Andrew’s cares for students during the formative years in which they are cherished, known, and loved. The academic, social, and emotional needs of children are paramount at St. Andrew’s. St Andrew’s has a strong academic program, enhanced by state-of-the-art technology, and includes foreign languages, music, fine arts, athletics, and information literacy skills. Student performances, dramatics, interscholastic sports, and community service round out the St. Andrew’s experience. Many of our Middle School students qualify to participate in the Duke University Talent Identification Program. Upon graduation, St. Andrew’s students have a solid academic foundation that opens doors for them at competitive independent, public, and parochial schools and are typically accepted to the high school of their choice. Small classes and caring teachers provide a challenging learning environment where children grow intellectually, socially, and spiritually. St. Andrew’s encourages faith formation and moral development by providing worship services, classroom instruction and opportunities for reflection and inquiry. St. Andrew’s students are excited about learning and about giving to others through community service. The School boasts an intimate, attractive campus featuring six classroom buildings and two playgrounds located on South Carrollton Avenue in Uptown New Orleans. Poised for growth, the School plans to add an additional classroom building in the near future to accommodate enrollment demand.